Now I saw a new heaven and a new earth, for the first heaven and the first earth had passed away. Please consider these two sections of Scripture. 2 Peter 3:7-13 “But the heavens and the earth which are now preserved by the same word, are reserved for fire until the day of judgment and perdition of ungodly men. Revelation 20:11-15, 21:1-3 “Then I saw a great white throne and Him who sat on it, from whose face the earth and the heaven fled away. And there was found no place for them. This world is temporary. It has been and is for now a place of testing. God did not make us robots. He gave us free will and with the option to honor and love Him or disregard and disobey Him. Some day this will all be history. Those that choose rightly, have a bright and wonderful future. Those that choose wrongly, will have to pay the price. Hell as a place, is somewhere in the earth, in some kind of spiritual dimension. The current hell that is there, is somewhat like being in jail while awaiting trial. Judgment Day, will be the time each of those from the current hell will appear before the Lord. The verse in 2 Peter 3, confirms and correlates with the verses shown in Revelation 20 and 21. The wicked who refuse the pardon of Christ and choose to rebel against God, will be cast into the lake of fire after their judgment (Revelation 20:15). The earth and its heaven (universe) will dissolve/melt. 2 Peter 3:10 “... in which the heavens will pass away with a great noise, and the elements will melt with fervent heat; both the earth and the works that are in it will be burned up. 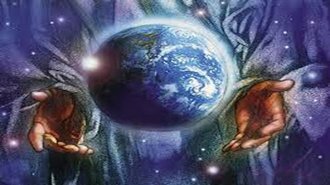 The earth will "give up" the people in its hell (they will be "called out" and the place they will be coming from will be changing also) and they will stand before the Lord for judgment. Ultimately and sadly, they all wind up in the lake of fire. Jesus did all He could for all of us. The forgiveness was acquired, but those who refused Him and His pardon, choose to pay the price that He gave His all to spare us from. Because all humans come from God, they are eternal. The earth and its elements will disappear in the heat but because all people are eternal, they have to go to heaven or hell. It is not complicated. Death and sin will no longer be a part of the world we will be living in! The home that Jesus went to prepare for us, the holy city, will come down from heaven onto a new earth. The new earth and heaven will be in one glorious accord. John recorded much more about it, but here is the beginning of life in and with Christ when the biggest change happens, when this old world and evil are gone. Revelation 21:2-3 “Then I, John, saw the holy city, New Jerusalem, coming down out of heaven from God, prepared as a bride adorned for her husband. The Lord will have His heart’s desire with a people, tried and true and we His people will have our God, in a beautiful life, that words cannot begin to describe for now. Thank You heavenly Father, thank You Jesus, Son of God, our Savior and thank You Holy Spirit, who has been closer than our breath and kept us to the end.